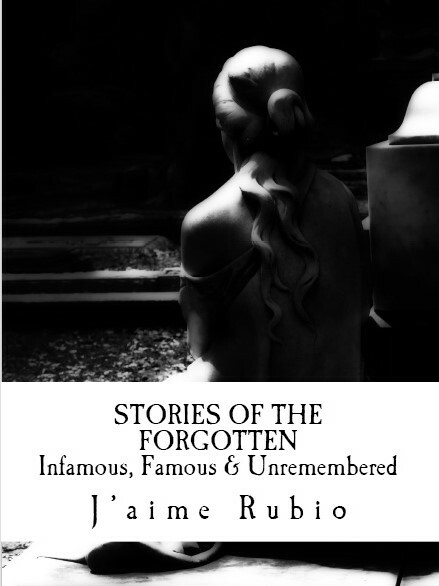 Continued from Part 3 - Who Was The Beautiful Stranger? 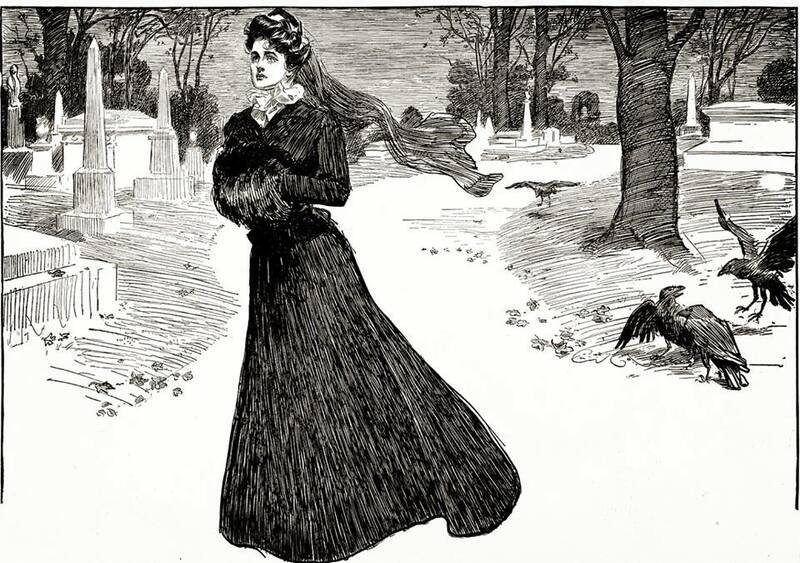 The death certificate was dated December 12, 1892, with her burial date on the document dated December 13, 1892. 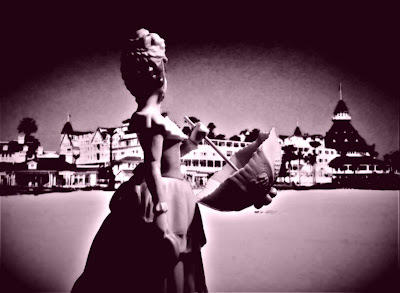 Unclaimed and never truly identified by family or friends, the funeral for the woman who died at the Hotel Del Coronado on November 29, 1892, said to be Kate Morgan, took place at Johnson & Co.’s undertaking parlors. After the services the casket was taken and interred at the Mount Hope Cemetery. The grave would remain unmarked for almost a hundred years until author Alan May had a headstone placed marking her burial spot. From its very beginning, this story has too many twists and turns to count. Although several authors have tried their best to unravel this mystery, the complete answers still seem to elude us, forever seemingly just out of our reach. Neither Lizzie nor Kate brought luggage with them when they left. According to Kate’s employer, Mr. Grant, she took only a satchel with her when she left. There is no accounting of where she went between leaving the Grant’s and ending up in San Diego an entire day later. Yes, Kate was known for using aliases as it would seem. She used the name Katie Logan for the Grants, and Josie Brown for the Howards, even mentioning her sister was a Mrs. Anderson, and having a brother who was also a doctor! So what about the three trunks left at the D Street Depot in National City? At the time, the newspapers reported that they were still there at the depot. According to the article, one of the keys found in “Lottie Bernard’s” effects in room 302 matched a key to the trunk, but the employees at the depot could not open it without proper permission from the authorities. Interestingly, the Los Angeles newspapers later mentioned that the three trunks were eventually claimed by its owners; however, there is never any further mention of the trunks or whether the owners were connected to the woman who died. In both situations, neither the families of Lizzie Wylie nor the families of Kate Morgan made any effort or attempt to positively identify the dead woman. Although Lizzie’s mother stated that she had family in San Diego and that they would come to identify the body, no one ever did. The same can be said for Kate’s family. Maybe Joseph Chandler believed the body was of his granddaughter, or maybe he felt bad for the unclaimed woman who was abandoned in death, which could have prompted him to pay for the burial. I have often wondered, if Chandler had truly believed it was his granddaughter, why not have the body sent back for burial? Had she shamed the family that much that he wanted nothing more to do with her? And even so, you would think that he would have at least wanted a proper marker on her grave, wherever she was interred. The event where Lottie sent Mr. Gomer to wire requesting funds from Mr. Allen at the bank in Hamburg, is definitely a piece of the puzzle in favor of the Kate Morgan theory, since Allen was in one way or another related through marriage to Tom Morgan’s family. Still, it was a Mrs. Bernard asking for money, not Kate Morgan. Allen stated that he went to school with her husband, who would have been Mr. Bernard. How would Allen have known that Lottie was Kate, especially given the vague telegram with no other mention of who she was? Oddly enough this could actually be just an interesting coincidence unless Mr. Allen was aware of Kate using various aliases. Did Kate know a Mr. Anderson? Was his wife’s name Louisa? Is that how she acquired the tin that was found in her trunk in Los Angeles? And what about Joseph Jones? He claimed that the couple who he had seen, rode from Denver to Los Angeles and recognized the woman at the Orange station . He also saw her again at the hotel. How could that be Kate, when she was in Los Angeles the entire time until leaving on Wednesday the 23rd? Among the items found in room 302 was an invitation to the Hotel Del Coronado, signed by Lillian Russell and Louise Leslie Carter. "Denman Thompson, the Old Homestead. And "Frank" is written here four times, and "Lottie Anderson Bernard," and "Mrs. Lottie Bernard," "Lottie Anderson Bernard, Detroit," and then on this paper I found "I merely heard of that man, I do not know him." Here is an invitation — here is an invitation to the Hotel del Coronado, signed by Louise Leslie Carter and Lillian Russell." Denman Thompson was a playwright and actor. He was very famous for his play, "The Old Homestead" which made it's debut in 1886. He was in the social circle of theatre actors and actresses. This stood out to me because of the second item in her belongings that also was tied to Theater folk. That was the invitation to the Hotel Del Coronado, which was signed by Louise Leslie Carter and Lillian Russell, both prominent and famous actresses of the time. Did Lottie have a personal invitation to the hotel, or could it have been clever advertising as author Terry Girardot suggests in his book? I have searched for ephemera for that time period connecting those actresses to any sort of advertising for the hotel and have come up with nothing. Another interesting thing to note was the mention of a telegram from Mt. Vernon from a Mr. Harry Bernard requesting a description of “Miss Bernard.” The same time this telegram came, another unidentified body of a woman in Mt. Vernon had just been discovered, Miss Ella Newton, which is another chapter in this book. Was this just a random coincidence? The last part of this mystery that just doesn’t add up is the cause of death. Only a fraction of the many writers who have researched this case believed that the woman found dead in Coronado was murdered. Being that the death certificate states it was a suicide, most people take that at face value and accept it as the cause of death. I, on the other hand, do not believe it happened that way. Remember, Lottie had purchased a .44 caliber Bulldog pistol and two bits worth of cartridges at Nichol’s gunshop where Martines Chick worked in downtown San Diego. Then she went to Frank Heath’s store and asked about purchasing cartridges there. The gun that was found next to her body was identified by Chick as looking similar to the gun he sold her on Monday the 28th, but he could not be certain. Still, the entry wound, and lack of exit wound on the body is consistent with shot of a .44 caliber Bulldog. According to gun expert Bob Shell, the .44 Bulldog is a very low powered round and the bullet would not exit. “It would not cause extensive damage due to the low velocity involved. As for rusting, it would rust fairly rapidly especially if there was no oil on it...... The process of bluing is just a form of rusting so overnight there would be a light coat of rust on it. Depending on a couple of factors, the 44 will leave a little larger hole then a 38 or 40.” After speaking to Shell, he made it clear that the doctor should have been able to see the small differences. “Depending on certain factors, the entrance wound could close up due to loose skin or other physical factors that the victim may have had. In other words there is no cut & dry method to determine an entrance wound with similar size rounds." Dr. Mertzman examined the bullet entry wound, and never once mentioned any sort of powder burns on her head or marks on her hand which should have been noted in the inquest had there been any apparent markings or burns on the body. This lack of information leads me to believe that someone shot her from a farther distance, just enough to leave her body free of powder burns. Another thing to consider in all of this is that the two bits worth of cartridges Lottie purchased were never found. If she had planned to kill herself, in all likeliness she would have loaded the weapon in the privacy of her own room. In 1892, two bits would have bought her 10 rounds. We know that the cartridges were never mentioned to have been found on or near her body when her body was discovered. Also, when the coroner came to investigate her room, those items were not found in her personal effects. So where did the other bullets go? Nowhere in the inquest record did anyone state whether or not the pistol was examined to see if it had even been discharged or not. Kate Morgan or not, I believe that the woman who died on the northwest steps of the Hotel Del Coronado on November 29, 1892, was murdered and did not commit suicide. I could devote an entire book restating each and every fact and clue regarding this one story alone, and I feel that I would never truly solve this conundrum. Some of you will read the story and come to the conclusion that Lottie was definitely Kate Morgan, while maybe a few of you will even think she could have been Lizzie Wylie. And then there will be others, such as myself, who will never truly be satisfied with this story, and who will go on believing that the true identity of Lottie Bernard can never be a certainty, and the story behind her death, will more than likely remain a mystery for the ages. If by chance somewhere out there, perhaps in an old creaky and dusty attic, tossed beneath books and family heirlooms in an old trunk, there could be one more clue to this seemingly impossible case, then I hope to be alive to see that day. Until then, we must accept what information is out there now. U.S. Census, 1860, 1870, 1880; Detroit City Directories, 1890, 1891; Transcript of Coroner’s Inquest, 1892; Certificate of Death, December 12, 1892; San Diego Union, (1892: 11/27, 11/30, 12/1, 12/2, 12/3, 12/7, 12/12); Los Angeles Herald, (1892: 12/1, 12/4, 12/9, 12/10); The Rock Island Daily Argus, December 5, 1892; Sacramento Union, December 3, 1892, December 5, 1892; The San Francisco Morning Call, December 2, 1892; Los Angeles Times, December 1, 1892, December 3, 1892, December 4, 1892, December 8, 1892; U.S. National Library of Medicine; Correspondence with Bob Shell, gun expert; San Francisco Call, December 2, 1892, December 4, 1892; Salt Lake Herald, December 4, 1892; “The Ghost of the Hotel Del Coronado, The True Story of Kate Morgan”- Terry Girardot (by permission of the author).